So I am moving to Malaysia this week, I know how many times have someone said this to you today? But really I am. And one of my most favorite geeky things are re-usable grocery bags. When I was moving out of my apartment in NY and escaping Hurricane Irene I used my cache of bags to place my records (vinyl music playing discs for the young one’s out there) in storage. So when it came time to do grocery shopping I had to buy a couple of new ones at the store. But then I noticed something I had not before, save a couple of my reuse bags (one if bamboo denim, another cotton) they are all plastic. And while they are better than getting a plastic bag for every item or every time you shop it is still plastic. Then I saw this email from the great site Ecouterre and they had a DIY produce bag made from an old t-shirt. And so I thought I can do something like that. And I did. 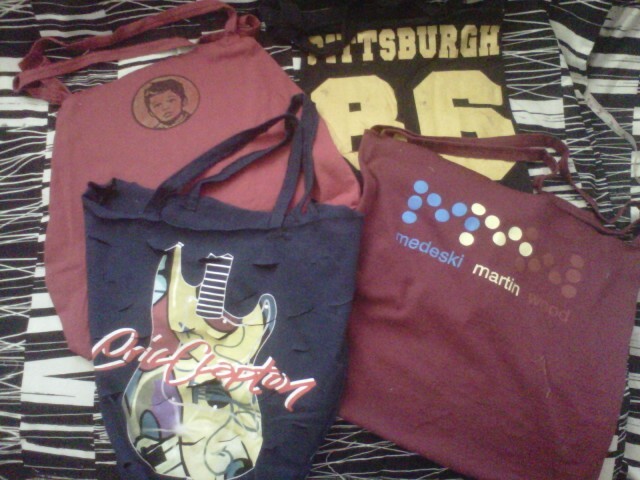 But instead of making all produce bags (which I love by the way) I made different sized bags based on the design of the t-shirt. I went to the Salvation Army (half off Wednesday of course) and bought four t-shirts for about $5. I selected the shirts carefully. One was a little sci-fi looking kids (I don’t know I just liked it); the other a t-shirt of a cool jazz band, another an Eric Clapton tour shirt (I like him well enough) and another a bootleg Steelers tee with Hines Ward’s number on it (I just couldn’t in good conscious cut up a real Steelers, Penguins or even Pirates shirt). There is no logic or great skill to this. I just laid out each shirt one at a time. And looked at what in my mind would make the most design sense and cut it out. 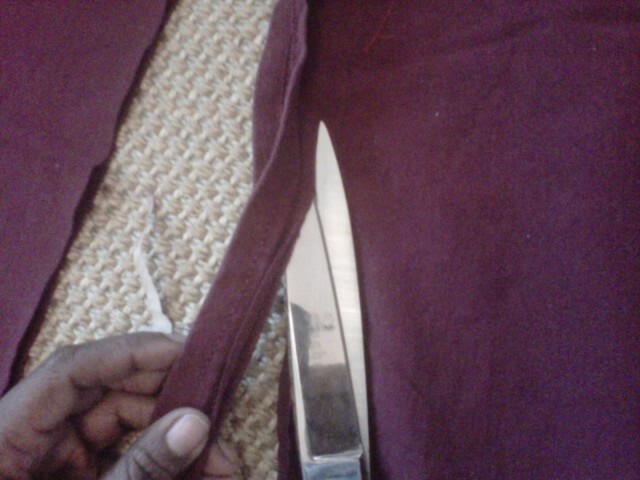 I cut it as necessary, leaving the bottom hem of the shirt intact and simply stitched up the three sides, double stitched actually, finishing the hem with a zigzag stitch. 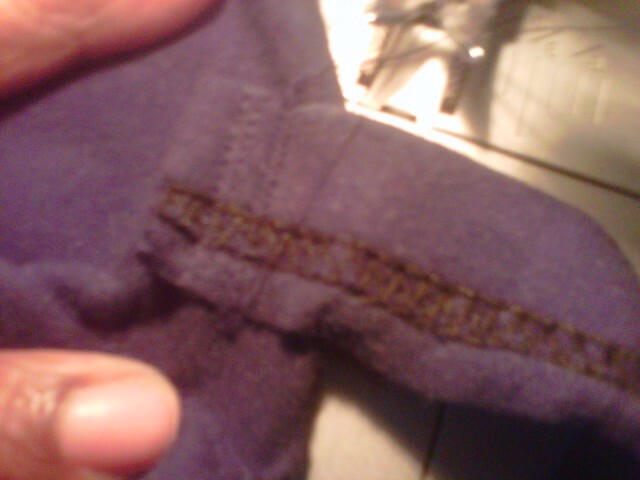 Then using the bottom hem as the straps (since they are already reinforced (why do the extra work). 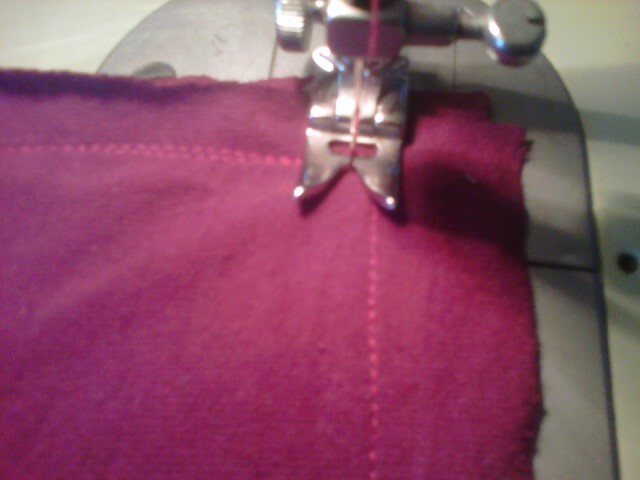 Double stitched and reinforced with zig-zag to finish the hem of the bag. Each bag is a little different. 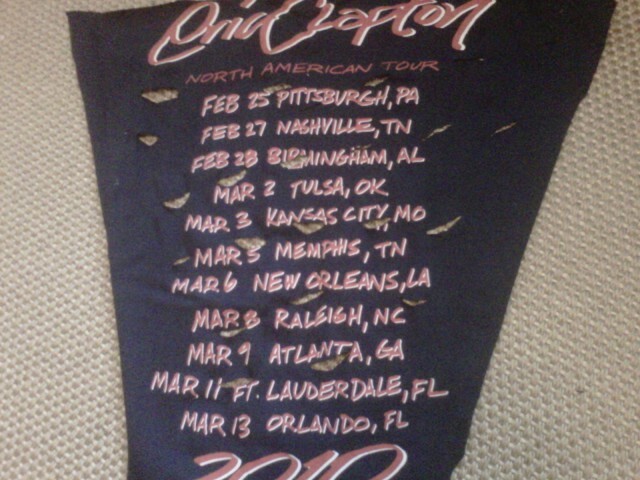 For example, the Clapton shirt had a design on the front and the back so I made it small and focused on the lettering and the guitar. Taken a cue from the Ecouterre story I added a few slashes, not a ton to ruin the purpose but enough to add a little Rock n’ Roll to the whole thing. 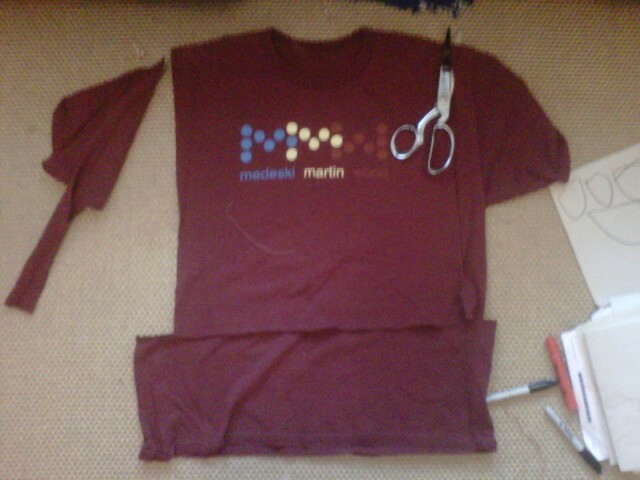 Using the design of the tee to decided on shape of the bag. 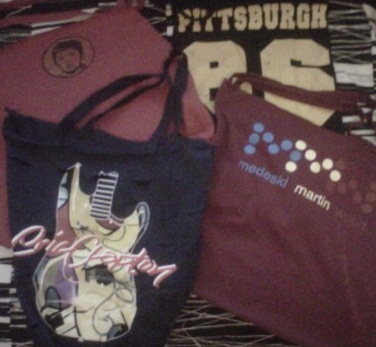 The Steelers shirt was long so I made that a long narrow tote; the MMW shirt was more horizontal so it’s a horizontal tote. And finally the Sci-fi kid’s face was the focus so I made an oblong design for the bag. Viola that is it, I am sure you can come up with a million different versions. I wanted to go grocery shopping half way around the world with something that reminded me of home. I think these will do the trick.